Granite's strength and durability make it a natural choice for kitchen countertops. Once polished, natural granite will maintain it's high gloss virtually forever. Because granite is the hardest natural stone, it is stain resistant and normal use of kitchen knives and cookware leaves no scratches. Heat has almost no effect on natural granite, making it much safer than synthetic surface. Why choose Marble and Granite over Synthetic Materials? There are many advantages to using natural stone instead of synthetic materials such as Corian, Formica, Porcelain, Concrete or Ceramic Tile. Natural stone is durable, long-lasting and is available in an endless choice of patterns and colors. Most people believe that natural stone is more expensive than it actually is. Not only is natural stone affordable but its resilience proves to be cost effective over time. Marble and Granite add a polished sophistication and enhance any room. Both can be used for countertops, flooring, fireplace mantels, and much more. However, even though marble and granite are similar, they can also be better suited for specific purposes. Marble lasts as long as Granite but is typically best used in bathrooms and mantels. Subtle color choices and veining patterns that marble offers can create more unique and exquisite designs in bathrooms. Physically, marble is less dense and is often the preferred choice for fireplace mantels because more intricate designs can be carved. Marble is sensitive to acidic foods which include ketchup, lemon, vinegar and wine. In exposing marble to these acids there is a risk of staining and dulling the polished finish. 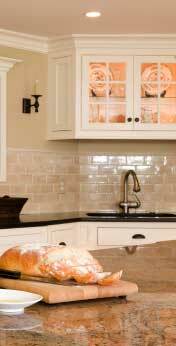 Greater density and hardness help make granite resistant to scratches, acids, stains and heat. Therefore, granite is a better choice for kitchen countertops. Granite is long-lasting and creates a beautiful, unique ambiance in any environment. Natural stone is a dense and porous material, thus it can get stained if a spill is not cleaned quickly. Sealing the surface with a water-based sealant is recommended to protect the stone from water patches and stains. Sealing can be done once a year or once every two years depending on the usage of the surface. Where do our Granite and Marble come from? The material in our yard comes from quarries all over the world such as Brazil, Italy, Noraway, China, Africa, and India. How can I prevent damage to my natural stone flooring? Sand, dirt, and grit cause the most damage to natural stone. Us a non-treated dust mop in high traffic areas two or three times a day. Placing doormats at entrances will help to minimize the sand, dirt, and grit that can harm the stone's surface. Make sure that the mats have a rubber backing underneath. Furniture legs should also be covered with felt or placed on a rug. Potted plants placed on the floor should be in moisture-proof containers or be placed on a protective pad. Clean your floor on a regular basis with warm water and clean, non-abrasive cloth, sponge, or mop. Will Granite or Marble stain? Granite and marble are porous materials and are subject to staining if not taken care of properly. In granite, the same porosity that allows for staining also allows for easy stain removal. In most cases, stains can be prevented by quickly blotting the spill with a paper towel. Don't wipe, as this will spread the spill. If a spill is left overnight, especially if the liquid is grease, oil, coffee, or wine the granite will usually darken. To remove the stain, a poultice should be used, which may pull out the stain from the granite. Marble can be stained and etched by acidic or oil-based products. Are there cleaning products that are harmful to my natural stone? There are many products that can harm natural stone. Do not use cleaners that contain vinegar, bleach, ammonia, or acid. Always check the product label for any of these ingredients. Granite is a very dense material and under normal conditions it is chip and scratch resistant. Marble can be chipped and scratched under normal use and therefore, should only be used in low traffic areas and should be treated like a piece of fine wood. What is the difference between 2 cm and 3 cm? And what is the most appropriate thickness for the tops? The 2 cm stone is approximately 3/4" thick, ranging from 5/8" to 7/8" in thickness. The 3 cm is approximately 1 3/16", and can range from 1 1/16" to 1 5/16" thick. Recommended thickness for kitchen countertops is 3 cm for both aesthetic and structural reasons. What tile sizes are available? Our tiles are available in many different sizes: 16x24, 18x18, 16x16, 12x12, 8x16, 8x8, 6x6, 4x8, 4x4, 2x2, 1x2, and 1x1. Do you sell material direct to the public? Louisiana Stone sells tile direct to the public, and we sell slabs direct to fabricators. However, we do refer our clients to fabricators and work closely with clients during their tile and/or slab selection.